Contrary to popular opinion, good sales ability isn’t a skill you’re born with. Instead, you can learn to sell just like you can learn anything else. And if you want to move forward, it is essential that you learn to sell effectively. Success in business starts with selling. Without sales, there is no money coming in the door. Without new business, companies cannot promote employees or pay bonuses or raises. New sales cures many problems and creates opportunities. But selling isn’t just limited to those with sales in their title. Whether you’re in an organization or on your own, you need to be selling something. Maybe you’re selling yourself to other employees, or selling investors on your vision, or selling customers on the value you provide. No matter what it is, learning to sell effectively is a skill that everyone can benefit from. If you can’t sell yourself to others, you won’t get far. But selling yourself requires knowing yourself. What talents do you possess? Can you speak well? Are you analytical? Do you have knowledge in a specific area? The more you know about yourself, the more confidence you will have and the easier it becomes to sell yourself. Know that any insecurities you have is appropriate, but everyone else has those same insecurities. Some are just better at hiding them than others. I would say more people underestimate themselves than overestimate. My guess is you have many hidden talents that others know nothing about. Getting others to see those hidden sides of your personality will open up opportunities that you never knew existed. Once you learn to sell yourself, you will be much better positioned to start selling products and services. In fact, if a buyer has bought you, getting them to buy something you’re selling is the easy part. Now that you are skilled at selling yourself, the next step is learning to sell other things. Listen to your customers. We all hate receiving cold sales calls. And one of the reasons we get so annoyed at sales calls is that it’s an invasion of our privacy. Maybe you’re eating dinner, or watching TV, or working when you get the call. The person on the other end doesn’t know you and the pitch is always one-sided. They want you to buy. They may know very little about you or your circumstances, and as such, you don’t feel comfortable with what they’re selling. Develop a relationship. We like to do business with people we know. There’s a logical side and an emotional side to selling. If we’re comfortable with the person we’re dealing with, we tend to trust what they’re saying and are more likely to buy what they’re selling. So before you can sell something, it helps to develop a relationship with the buyer. Build name recognition. If you’re selling online, it may be harder to develop a relationship in the traditional sense. And whether you’re selling face-to-face, over the phone, or online, you can increase your success rate by building recognition. Again, people are more comfortable buying from someone they trust. Ask for the sale. It may seem obvious, but I’ve seen many people in a sales meeting follow all the appropriate steps and when they get to the end of the meeting, they don’t know how to ask for the business. For some reason, actually asking for something often makes people uncomfortable. Going into any meeting, know what you’re trying to accomplish. Is it to get another meeting higher up the chain of command? Or is it to actually get the sale? Whatever the intent, make sure to ask for what you want before you leave. And finally, just like anything, the more you practice selling, the better you will get. Try this activity to improve your sales skills. Find a commodity product to repeatedly buy and sell on eBay or Craigslist. Learn how to position the product. What description gets the best response. How do you price the product? What time of day or day of the week do you place the ad? Can you make small profits doing this? I tried this with golf clubs a while back buying individual clubs and reselling them. Starting with drivers, I realized that one of the challenges was counterfeit clubs. I learned how to convince prospective buyers that while the clubs were used, they were still genuine. Images were also important. People wanted to see the actual club they were purchasing. Posting a manufacturer’s image made buyers feel that the actual club was not in as good shape as the description indicated. In the end, I realized it was difficult to make enough profit reselling the clubs to offset the shipping and transaction costs. My next step was buying sets of clubs and reselling each club individually. There is a market for buyers who need to buy a single club. Sometimes they break a club. Often they lose club. And most golfers like to have a complete set of matched irons. This strategy was more profitable because my front-end costs were less on a per club basis, but it also required significantly more upfront investment. And there was more risk if I couldn’t sell all the clubs in the set. I hope you realize how important selling is to a successful career. Learning and perfecting the skills required to sell will take you far. 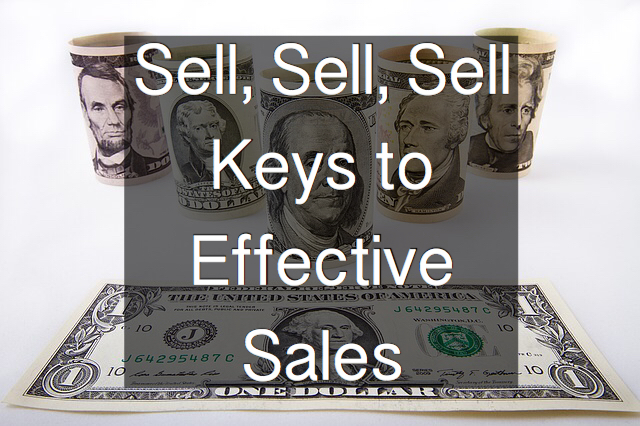 Start following the above steps and begin improving your selling effectiveness today. Readers, what other techniques help you increase your selling effectiveness? Do you know anyone who excels at selling? I love to see and read about good sales people or organizations. Hey FS, you’re right. Being good at business is at least 50% the ability to sell. You can’t be the best artist in the world, sitting in your gallery expecting the masses to come – you have to get them through the door! For us as bloggers, selling is getting our blog ‘out there’ through social media, commenting, etc etc. It’s a balancing act between creating content and ‘selling’ content. There are many ways of selling ourselves, some far more effective than others. I didn’t mention it, but you’re right. Running a blog is a perfect way to develop and hone your selling skills. Too true. Sales is a vital component of success in life, not just business. Whether you’re selling yourself in a job interview, selling your services as a consultant, or your future to a prospective mate, there’s always an aspect of sales. Being able to elicit your client’s needs and position your strengths as solutions to those needs will get you a long way in life. Even more important, of course, is validating your client’s needs against your own to ensure you’re making a good sale with a strong long term value, whether it’s in business, or love. A good sale pays for itself many times over. Even more general: making progress in life is probably mostly selling! You can be a hard worker, when you can not sell your work and results, you stay under the radar. Sadly, some manage to sell stuff they hardly master/have done themselves…! I am with you, ATL. It’s difficult to have the patience to build a relationship. But it’s definitely worth it.